Three students from the California Academy of Mathematics and Science have won highly selective national awards that encourage the pursuit of careers in science and cancer research. 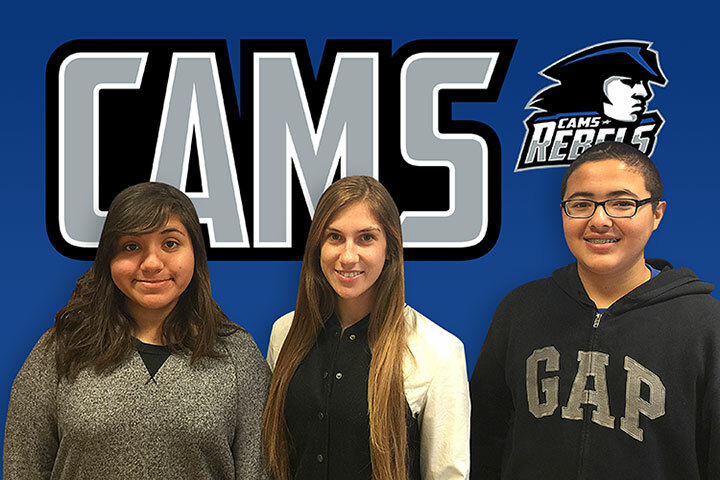 CAMS students Kaetlyn Rodriguez, Alexandra Ruszczyk and Antony Alvarado are among only 13 recipients statewide and 100 nationwide selected from nearly 1,200 applicants for the inaugural year of the Emperor Science Awards, which include a unique mentoring opportunity. Award recipients will work alongside an esteemed scientist on a rewarding multi-week cancer research project, and they’ll receive a Google Chrome Notebook to support their studies, plus a $1,500 stipend for expenses. The opening of applications was announced in September by partners Stand Up To Cancer (SU2C), a program of the nonprofit Entertainment Industry Foundation, and PBS LearningMedia, a media-on-demand service designed for K-12 classrooms. Biotech and healthcare firms Bristol-Myers Squibb, Genentech and Novartis have provided funding to award 100 students every year for three years. The winning students demonstrated awareness of emerging developments in cancer treatment including precision medicine, immunotherapy and epigenetics, or the study of chemical modification of genes or gene-associated proteins of an organism. They are interested in nanotechnology, basic cellular biology, gene mapping, toxicology, DNA splicing, development of biomarkers and computational sciences. From laboratory studies and mouse models to exploring marine organisms and their potential to provide “natural” cytotoxins for cancer research, students’ research interests were impressive, the award announcement stated. “Our hope is to inspire more students to explore careers that may lead to future innovation in cancer care,” said Laura Bessen, vice president and head of U.S. Medical for Bristol-Myers Squibb. EmperorScienceAward.com lists all of the award recipients and provides links to pbslearningmedia.org’s cancer-related resources for teachers and students. CAMS earned a spot on Newsweek’s most recent list of America’s top 500 high schools. Newsweek provides two lists, each with 500 schools. The “Absolute” ranking is based solely upon performance, while a “Beating the Odds” ranking controls for student poverty rates. CAMS made both lists. The high school, run by the Long Beach Unified School District on the campus of Cal State Dominguez Hills, has earned numerous national honors, including recognition by U.S. News and World Report, the Washington Post, USA Today and the U.S. Department of Education. CAMS is being replicated as the Sato Academy of Math and Science in East Long Beach, where the school’s first freshman class started last fall. BIOTECH SAVVY – CAMS students Kaetlyn Rodriguez, Alexandra Ruszczyk and Antony Alvarado earned national awards pairing them with a scientist on a cancer research project. Global biotech firms gave the awards to only 13 students statewide and 100 nationwide.